»Bangalore To Halebidu - Pilgrimage To The Gem Of Indian Architecture! Bangalore To Halebidu - Pilgrimage To The Gem Of Indian Architecture! Halebidu, also known as Dwarasamudra, the glorious capital of Hoysala Dynasty, is located in Hassan district of Karnataka. Halebidu literally translates to "Old City", a name acquired after getting ransacked by Malik Kafur's army in the 14th century, after which the town was in shambles. It was the capital of the royal empire for 150 years during the 12-13 century BC. It possesses some of the best work of art, owing to the artisans of Hoysala era. Hoysaleswara Temple and Kedareshwara Temple are the two most brilliant example of the empire's craftsmanship. These temples are usually open from 9 am to 6 pm. Since it is located just about 5 hours from Bangalore, Halebidu can be your weekend destination. An ideal time to visit Halebidu is between October and March. Hoysala Mahotsava is an extravagant dance festival that takes place in both Halebidu and Belur, the two capitals of Hoysala Dynasty. If you wish to experience this exclusive festival, then March is the best time to visit. Nelamangala, a town situated on the outskirts of Bangalore, is located at about 26 km from Bangalore. Binnamangala, also known as Vishwa Shanti Ashram, is a picturesque park with enormous statues of Panduranga and Vishwaroopa Vijaya Vittala. A unique fact about the Lakshmi Venkataramana Swamy Temple here, is that the main deity is worshiped along with his royal mount, Garuda. It consists of three shrines, surrounded by decorated pillars, structured in Chola style of architecture. Located 88 km from Nalamangala, Adichunchanagiri is a spiritual headquarters for the Vokkaliga community of Karnataka. The Adichunchanagiri Math, also known as Mahasamsthana Math, is located on rocky hills. Apart from this, the hills house a number of temples, one of which is Kalabhairaweshwara Temple. The temple is said to be "Kshetra Palaka" (protector of the region) of the Adichunchanagiri Math. Lord Gangadhareshwara is the presiding deity. About 50 km from Adichunchanagiri and 20 km off-route, lies the small town of Shravanabelagola. This town is popular for housing the Gomateshwara statue, the tallest monolithic stone statue of the world. The statue of Gomateshwara, or Lord Bahubali, is made of a single block of rock and is 58 ft high. The statue is perched at an altitude of 3,347 ft on the Vindhyagiri Hills. Climbing up to this enthralling sight itself is a trek, with 600 steps to complete! Channarayanapatna, located 12 km from Shravanabelagola, is known for the beauty of its temples. Lakshmi Narasimha Temple and Sadashiva Temple in Nuggehalli are the two most popular temples visited by tourists. 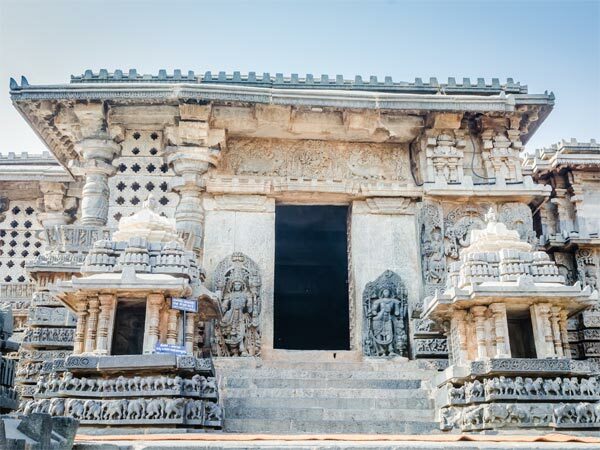 These temples, built with soapstone, belong to the 11th century Hoysala period, a relic from the royal era showcasing their exquisite work of art. The intricate detailing shown on the temple shrine will leave you captivated! Hassan is known for being the seat of the Hoysala Empire, from where large part of South India was ruled. It is located roughly 38 km from Channarayanapatna and about 180 km from Bangalore. This district was named after the presiding deity of the town, Goddess Hasanamba. Out of the many divine temples, Hasanamba Temple built in the 12th century, is considered to be an epitome of temple architecture in Karnataka by archaeological experts. This temple is open only for a week every year during Diwali, so obtaining Darshan (view) is considered highly auspicious! Read further to know about temples of Halebidu. One of the largest temples dedicated to Lord Shiva, Hoysaleswara Temple of Halebidu is an enchantingly beautiful temple, enlisted in the UNESCO World Heritage Site. It was built during the time of King Vishnuvardhana Hoysaleswara, thus the name is believed to be dedicated to him. The temple is made of soapstone, and has two main shrines; one for Hoysaleswara and the other for Shanthaleswara, named after King Vishnuvardha's Queen, Shantala Devi. Another magnificent temple dedicated to Lord Shiva, is the Kedareshwara Temple, located just about a km from Hoysaleswara Temple. Known for intricate sculptures, the temple is a three shrine structure, with a tower only for the central shrine. This temple was built by Hoysala King Veera Ballala II and Queen Ketaladevi, which is now under the protection of Archaeological Survey of India. Located between Hoysaleswara Temple and Kedareshwara Temple, is Basadi Halli, the place of Jain temples. There are 3 Jain temples, i.e, Adinatha Swamy Temple, Parshwanatha Swamy Temple and Shanthinatha Swamy Temple. Several monasteries are also found in this area. The statue of Parshwanatha Swamy is carved out of black stone which is 14 ft in height. One can see a seven-headed serpent that guards the deity, at the head of the idol. Veera Narayana Temple is another masterpiece of the Hoysala Empire, located in Belavadi, 11 km from Halebidu. Historically, Belavadi is believed to be the place where Bhima, one of the Pandava princes, had killed the demon Bakasura to protect the villagers! This temple was also built by Hoysala King Veera Ballala II, dedicating it to Lord Vishnu. Belur, the former capital of Hoysala Empire, is located just 22 km from Halebidu. It is famous for Chennakeshava Temple built by the Hoysala King Vishnuvardhana, on the banks of Yagachi River. Artists of this temple have signed their work in the form of inscriptions on the walls of this temple.